In narrow Labera Street, just inside the city walls near the Geroro Gate, at the southern end of the city, lives the girl with whom one might at last find happiness. One can see her sometimes, reading or embroidering by herself on the second floor terrace of her home. 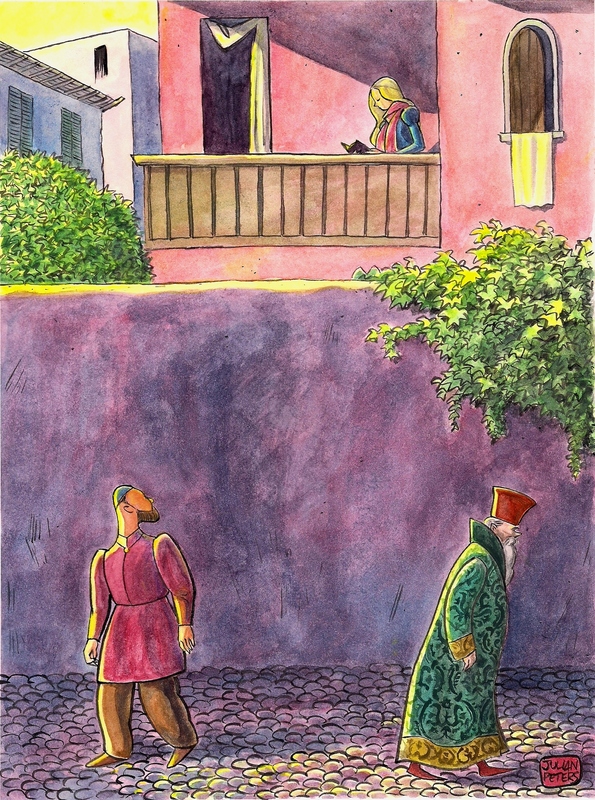 One looks up at her when one passes, but of course one cannot linger too long –what will the passersby think? At most one can walk by a couple of times affecting the air of one who is slightly lost. And perhaps one is at that. Of course, she is far too young for one, not to mention far too beautiful, one doesn’t have a chance, really… and yet, theoretically speaking, it is not strictly beyond the realm of … one cannot pronounce it categorically impossible that she could… And that razor-thin sliver of hypothetical possibility is enough to drive one half crazy. If she would at least look up from her book or her embroidery for a moment, maybe if one could just catch her eye, then… but doesn’t it show such a lack of curiosity on her part, such self-absorption, really, never even to look up every so often? She should pay attention to the world around her once in a while! Has she no interest whatsoever in her fellow creatures? Her and her stupid scarf! Really, who does she think she is? And meanwhile, every time one walks by and sees her, all the suffering it causes -Not that she cares! How one hates her. This entry was posted in illustration, Imaginary City and tagged beautiful strangers, passersby, the girl. Bookmark the permalink. Something Bocciccian about this little fable, that is, if it’s an apt description. In any case, it lets the imagination wonder, wander, linger and speculate about this mysterious girl personifying the pursuit of happiness. I dig it! The old “Oh, I thought you ordered some fruit” trick, eh? The oldest strategy of all, I suppose, seeing as that’s how Eve bagged Adam. Ouch again. Reminds me of Romola too. Ouch! OH LIFE! Ouch! I guess you must find ways to bring her fruits, pretending you have a wrong address. Since all think that she is unreachable, and none has the courage to speak, what if the truth was surprisingly simple. There is a french novel on a young woman who has a wine stain (?) that she hides with a scarf. Or maybe she has a scarr that makes her believe she is the ugliest person alive. All human beings need love and love is soooo blind. What will happen is that she will leave with the most unworthy just because he had the gutts, since he cares about none but himself and she will be his best trophy yet. Yes, you should hurry and bring fruits to her door, or tomatoes if you insist, she is too nice to have her heart used so shamelessly.